1958 marks a point of significant transition for modern set design. 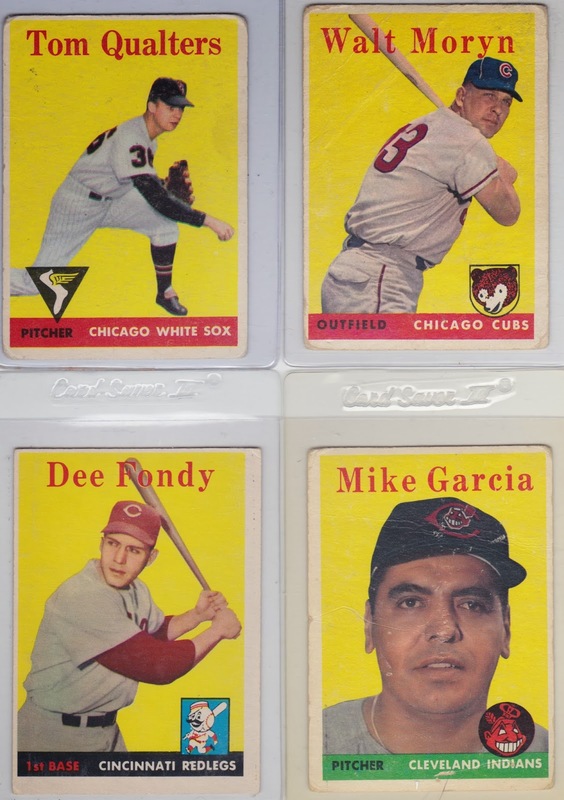 Here are five things that distinguish this one for baseball fans and collectors. Thirty-three of the first 108 cards have yellow player or team names, giving variation fans some extra work. 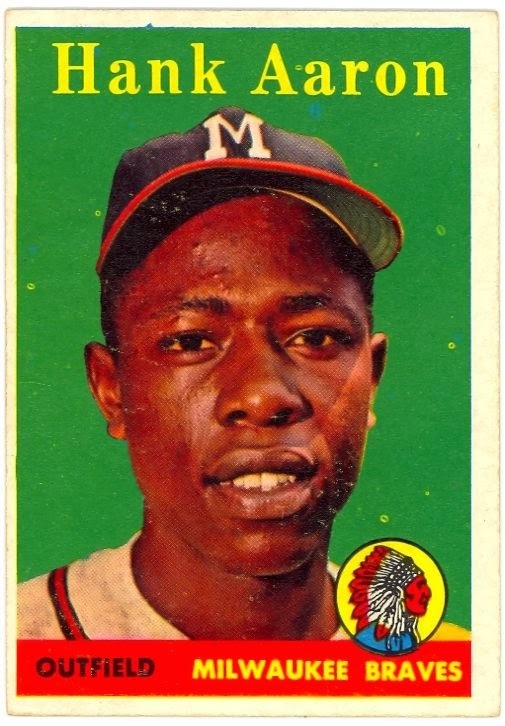 Best-known is #30, Hank Aaron. 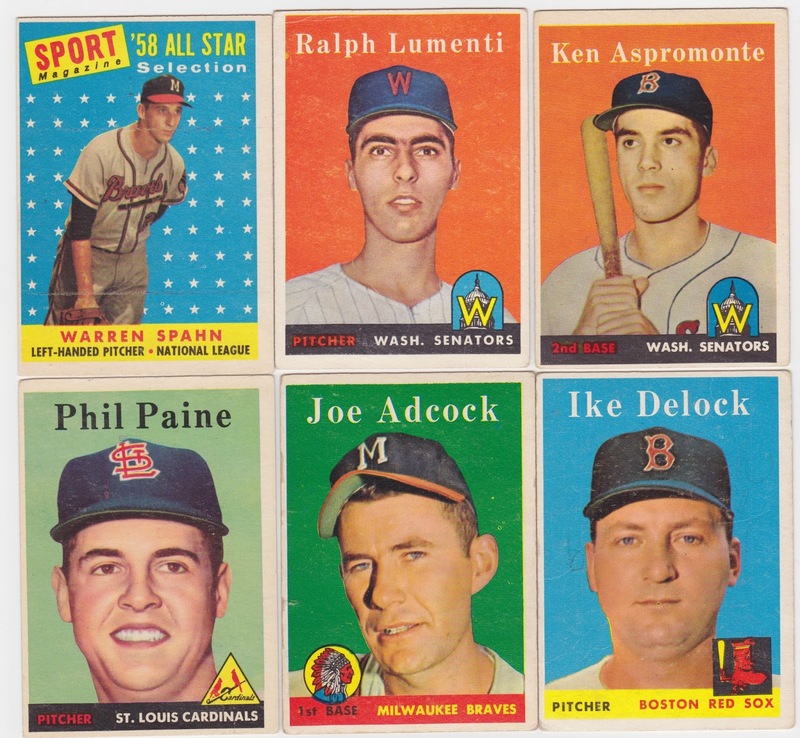 This Topps set debuted All-Star Game lineups (from 1958's game in Baltimore) and its late-season series featured the first mass-produced Stan Musial card since Bowman's 1953 photo set. 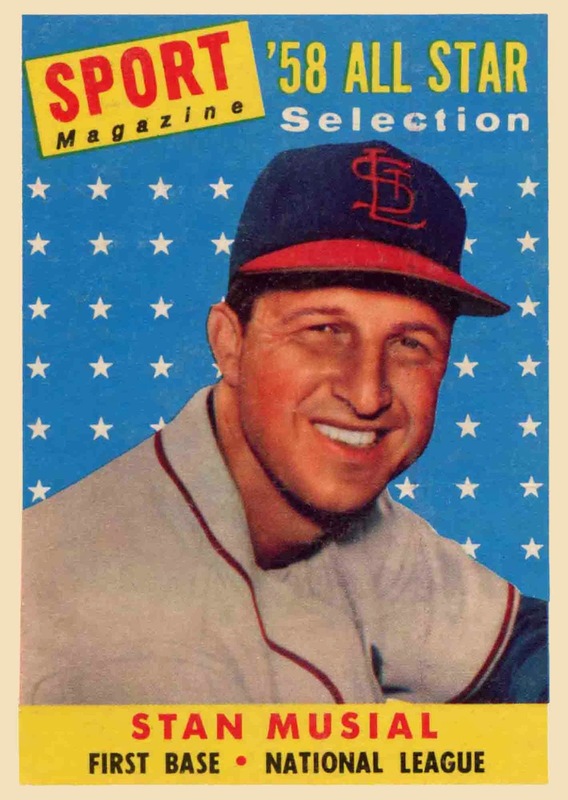 It's even possible Topps added this All-Star subset thanks to Musial's return; they made it a regular feature soon after. TRIVIA: Given the 1958 All-Star Game's proximity to Washington, D.C., MLB invited Vice President Richard Nixon to throw out its first pitch, a task he repeated many times as President. 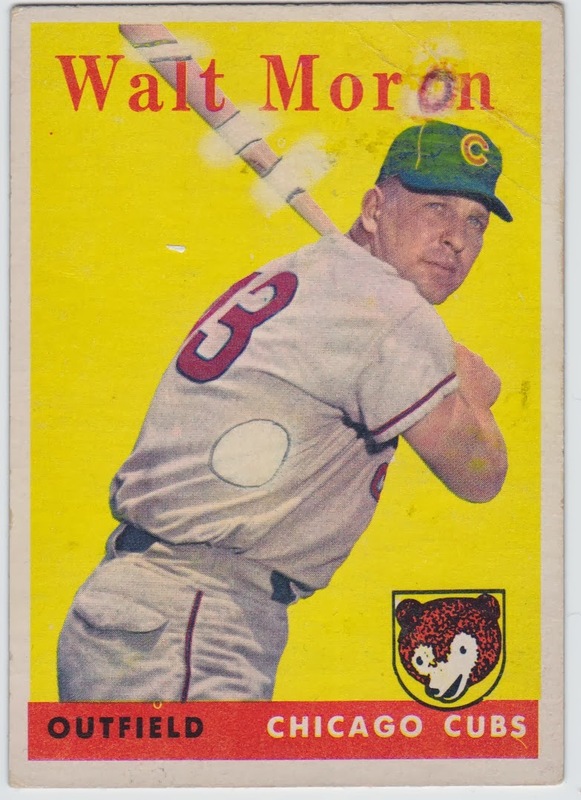 Major League Baseball suspended Ed Bouchee for most of 1958, so Topps did the same. While Ed appears on this checklist at #145, no card of Bouchee exists outside of hobby creations like the one by SCD editor Bob Lemke. 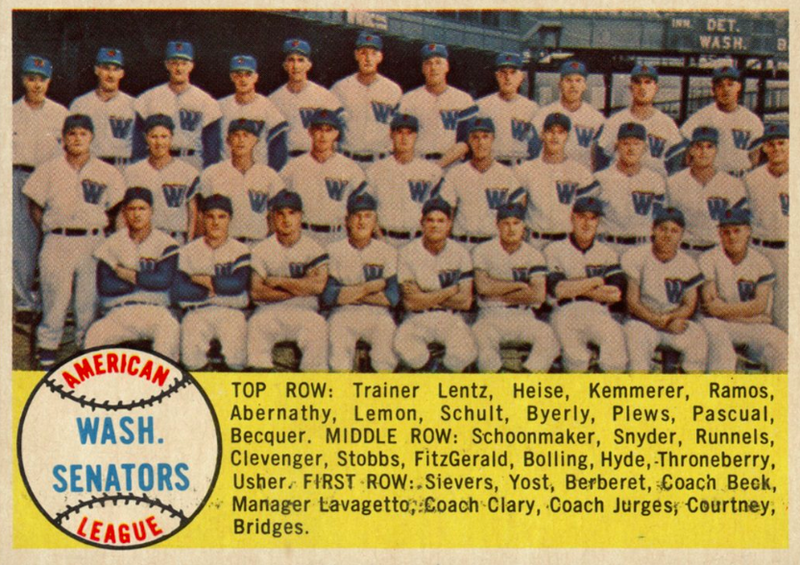 #44 above is also the Washington Senators team card, as Topps first integrated set tracking into the "regular" series. 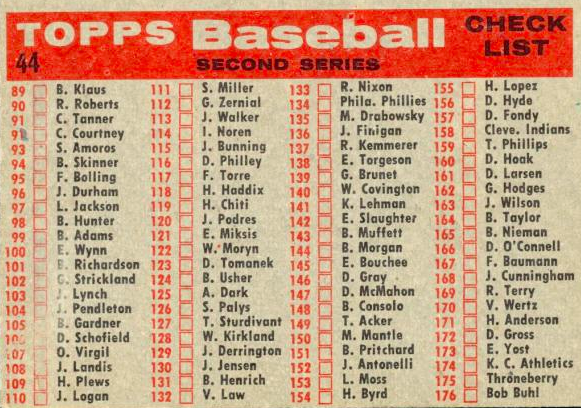 Topps left 1956 & 1957 checklists unnumbered, assuming kids would discard them after filling all the boxes. 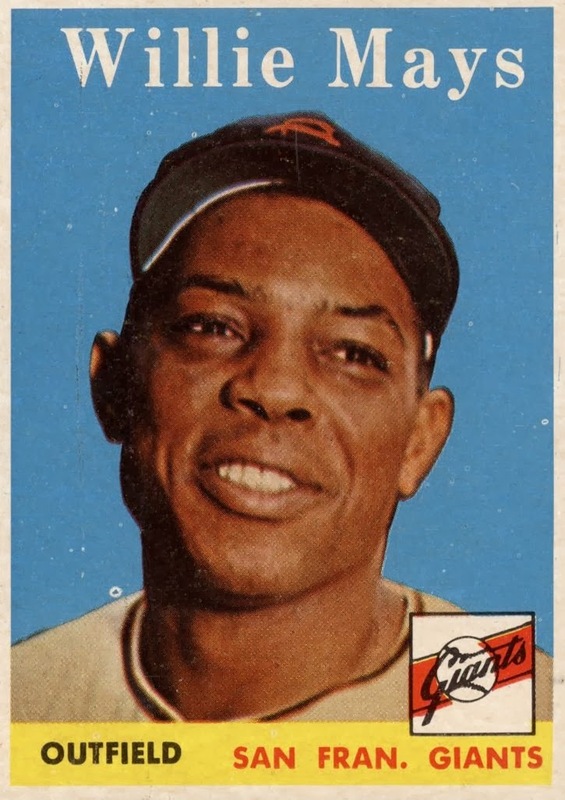 Customers might've requested this change, or at least responded well to it, because Topps made it a part of numbered sets going forward. OldBaseball.com friends Wes Shepard, Mark Zentkovich, Lynn Miller, Sal Domino, Kevin Martens, and Don Rice all aided my upgrade quest; several hits shown below. Jan 22: four-pack of upgrades from Mr. Haverkamp! 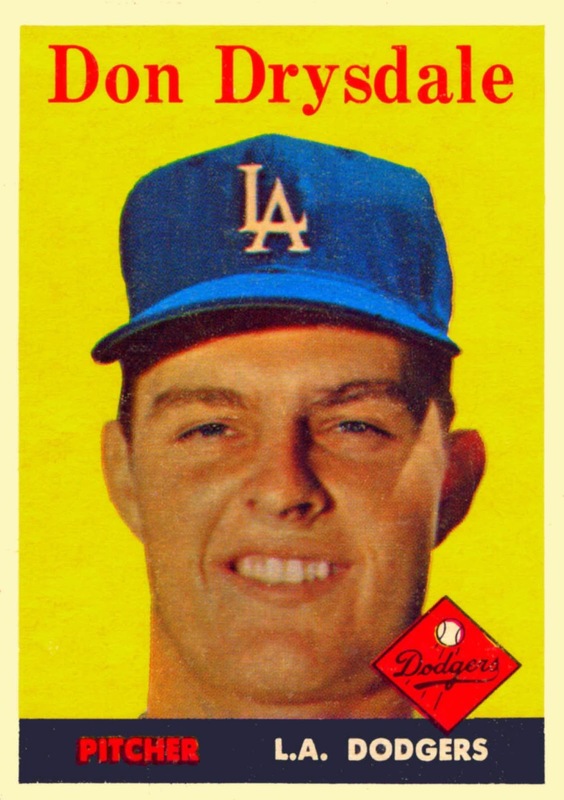 For posterity, here's the Walt "Moron" card he upgraded. Ouch. Aug 4: Upgraded #227 Vern Stephens at the 2014 National! July 30: Five six upgrades from OldBaseball.com brothers at the 2015 National! I've got 4 for you, send me a msg with your mailing address, will send 'em out. Have enjoyed your blog for years, glad to find something I can help you with! Updated with a scan of your cards, thanks again!